I don't CARE if you -- a mere BODYGUARD -- thinks his hair is out of place, I tell you he looks FABULOUS, so DON'T TOUCH! 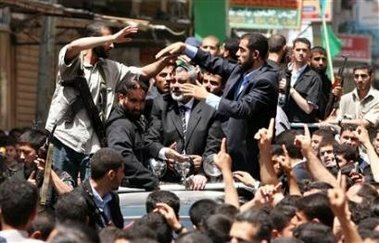 Jumpy Hamas security guards yesterday gave Palestinian Prime Minister Ismail Haniyeh two bruised ribs and a sprained neck when an excited supporter in the crowd cried out "Allah Akhbar" as the motorcade passed by. Ok, let the charity bidding begin! First item up for bid, dinner for two with the Prime Minister. What are my bids? Do I hear one? One anyone? TWO! I hear two in the back! Hurry, we're entering Fatah territory! Hamas Team Super Powers ENGAGE! Defensive bullet proof shields ACTIVATE! Palestinian sources explained that the commotion around the Prime Minister's motorcade was the result of security guards getting rid of one of the Zionist entities new mosquito drones intent on assassinating the Palestinian leader. Feel free to add some more. This picture just looked too ridiculous to me to let it pass unscathed. // posted by AbbaGav @ 6/04/2006 12:08:00 AM | | | Permalink | EmailThis!